The global market for automotive sheet metal components has a largely fragmented competitive landscape featuring a large number of small and large players and the leading four players collectively accounting for a nearly 40% of the overall market in 2016, observes Transparency Market Research (TMR) in a recent report. Although the market features low entry barriers for new companies, setting up of manufacturing units for automotive sheet metal components require huge capital and resource, thus limiting the scope of growth of new vendors. Product innovation and development are key strategies adopted by most leading market players. New product innovation is an important strategy to combat the stiff competition in the market. Companies are focusing more on research and development activities to create innovative products to capture and maintain larger market share globally. Focus on expansion across emerging economies with a huge and rising appetite for high-end and passenger vehicles has also significantly increased. Transparency Market Research states that the global automotive sheet metal components market will exhibit a moderate 3.7% CAGR from 2017 to 2025, rising from a valuation of US$104.30 bn in 2016 to US$142.41 bn in 2025. In terms of material, steel contributed nearly 60% to the overall revenue accumulated by the global automotive sheet metal components in 2016 and is expected to remain the most preferred metal over the forecast period as well. In terms of geography, the global automotive sheet metal components market is presently led by the Asia Pacific market. China, one of the largest manufacturer of sheet metal components globally and one of the leading consumers of passenger vehicles, is expected to continue to drive the Asia Pacific market over the next few years, helping the regional market retain its top spot in the global market over the forecast period. In the past few years, there has been a vast rise in the production of vehicles across the globe owing to the rising demand and usage of passenger vehicles. 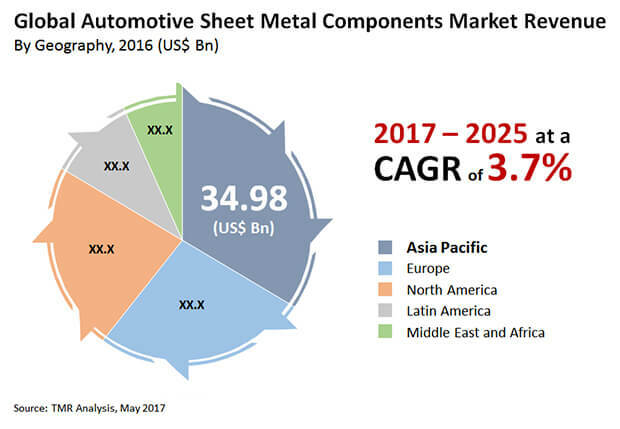 This, coupled with the rising demand for lightweight vehicles, is driving the demand and growth of sheet metal components used in the production of automobiles. A small percentage of hybrid and electric vehicles are already available in the market and the percentage is expected to grow at a healthy pace in the coming years owing to their least impact on the environment in the form of emission of pollutants. With the rise in the number of hybrid and electric vehicles in the automobile market, the application and market for sheet metal components in such vehicles is also expected to flourish in the near future. Moreover, the strengthening trend of engine downsizing of automobiles is expected to influence the growth of the automotive sheet metal components market globally. As steel and aluminum are the two most used materials used for the manufacturing of automotive sheet metal components so their availability and fluctuation in prices make a huge impact on the overall market of automotive sheet metal components. China is the presently the leading producer of aluminum and steel globally. However, the country has been curbing its production of these metals to curb the level of air and water pollution. This has been creating a huge gap between the supply and demand of aluminum and steel across the world. Moreover, concerns relating to the volatility in prices of aluminum and steel have also increased globally. Therefore, availability and volatility in the pricing of aluminum and steel are expected to inhibit the global automotive sheet metal components market, where the two materials find immense application.